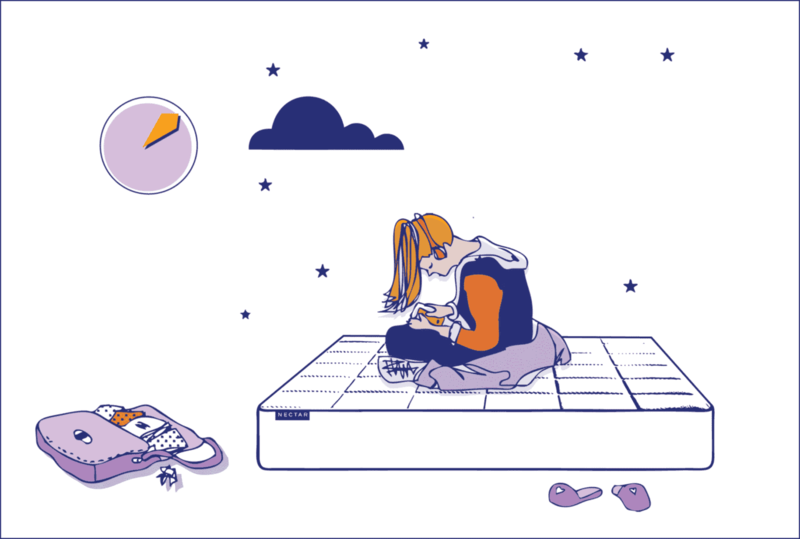 When it comes to buying a mattress, options abound. From memory foam to latex to coil, it can be hard to choose what mattress is right for you. Don’t get stuck being Goldilocks – this one is too-small and this one is too-big – and purchase the wrong mattress size. We created this guide so you can find your ideal mattress and feel confident in your purchase. 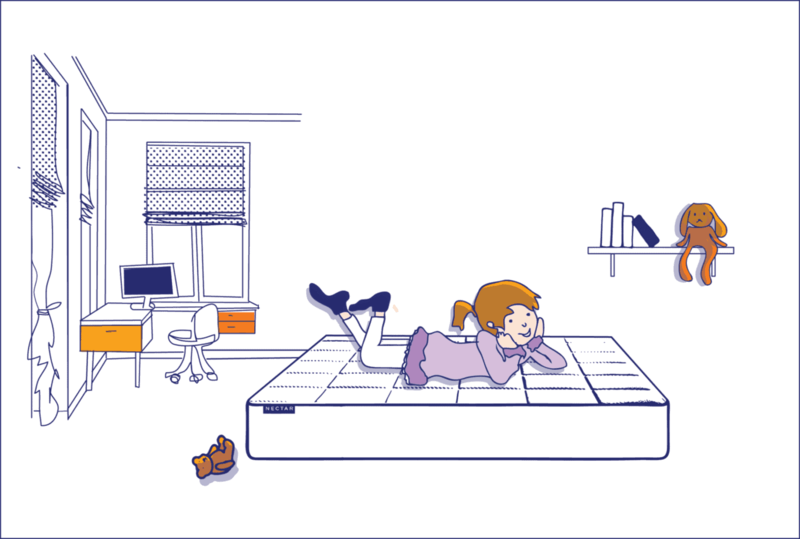 Remember that with a mattress that has a Forever Warranty like Nectar, you’ll want to buy a mattress that you can grow into – but will still fit into your room. This helpful guide will help you understand how beds are sized and terminology used for mattress sizes so you can find the best mattress for you, your home, and your lifestyle. Best For: A couple who loves to stretch out, and maybe have a pet join them. Room Size: A room that is 10 feet by 12 feet can hold a King-sized bed with two nightstands and a dresser however it will be a cozier fit. The recommended ideal room size for this bed would be 13 feet by 13 feet up to 13 feet by 19 feet. Summary: Well, they say this bed is fit for a King, and it’s no surprise when you consider that a King is a Full 76 inches by 80 inches. It’s 16 inches wider than a Queen (but no longer) so if you are sharing a bed, you will each have a full 38 inches, which is the equivalent width of two Twins pushed together. If you sleep with a partner then a King-size bed is going to be your best choice. The only downside? This luxurious size might not fit in your bedroom (or up the stairs!). How to move and assembled your bed is a careful consideration. That’s why Nectar ships directly to your door and offers White Glove Service to help you out with set up in your bedroom. Before you order a King, measure your bedroom and mark the floors with tape to make sure this sized mattress is going to be a good fit. If you order a mattress that has an optional delivery service or comes direct to your door rolled up like Nectar this will make your setup much easier. Remember that these mattresses can be heavy to move alone. But once you have your spacious King, you will feel like royalty each and every night! Best For: A couple who loves to stretch out, and maybe have a pet join them – but needs the additional length instead of width due to a slightly more narrow room. Room Size: For frame of reference, a larged sized bedroom that is 14 feet by 19 feet can comfortably hold a King-size bed, two nightstands, a TV stand, some kind of cozy chair, and a dresser. A smaller, 10 feet by 12 feet bedroom up to a 13 feet by 19 feet bedroom can hold a King-sized bed with two nightstands and a dresser but it will be a cozier fit. Summary: What’s the difference between a King and a California King? You are not alone in asking this question! It turns out that California Kings are a bed with West Coast roots. In the early 1960s, an LA furniture company began making oversized beds for celebrity mansions. At 72 inches by 84 inches, this bed became the largest on the market. The good news is that you don’t have to be a celebrity (or have a mansion!) to have a California King size bed. And at 72 inches wide by 84 inches long, these are actually 4 inches narrower and 4 inches longer than a regular King. King size beds are best for individuals who are taller and need the extra length, or for bedrooms that are longer than they are wide. This will help fill up the space of a narrow room proportionately. When it comes to whether you should get a King or a California King, just take into account your bedroom size, nightstands, and maneuvering the mattress. Once those items are addressed, you’ll sleep like a King. Best For: Teenagers, young children with parents who like to read to them in bed, or a single person with a dog. Room Size: To adequately fit a Queen as well as have room to walk around the bed or fit other furniture, a bedroom should be at least 9.6 feet by 10 feet in size. The recommended size for a Queen bed can vary from 10 feet by 10 feet or up to 10 feet by 14 feet depending on how much furniture you have and how much walking room you want around the bed. Summary: Queen mattresses might very well be the best of all worlds since they comfortably fit two people, and most bedroom spaces. Considered the most popular mattress option on the market, the dimensions of a Queen bed dimensions are 60 inches wide by approximately 80 inches long. They are an additional 7 inches wider and 5 inches longer than a Double or Full-size mattress. These added inches can make all the difference in comfort, especially for couples, and have made the queen-size mattress today’s most popular mattress size. However, with 30 inches of personal space, they certainly aren’t as roomy as a King which gives an additional 8 inches per person on top of that. Still, a Queen-size bed is the obvious option for couples who are fine sleeping closer together or just want more leftover space in their bedroom. Those who are single will love being able to fully stretch out without feeling like they are drowning in a King-sized bed, and those who have a dog or child who likes to crawl into bed with them might find that their Queen sized bed will still offer plenty of room. When considering a mattress, you can’t go wrong with a Queen. Room Size: To adequately fit a Double bed and have room to walk around or fit other furniture, a bedroom should be at least 9 feet by 9.6 feet in size at the minimum. Note that the average room size for this mattress is up to 10 feet by 12 feet. Summary: Coming in at 54 inches wide and 75 inches long, a Full mattress (also known as a Double bed) is the same length as a Twin, and not actually “double the width of” a Single, which can be misleading. In fact, it’s only 15” wider than a Single. A Full or Double is not really a “Double” for people either as it is best for a single sleeper who wanted more width, but it doesn’t give them any more length. It might be a good idea to choose a Full size instead of a Twin for your teenagers room if you don’t have room for a Queen. The extra room can also be helpful for a younger child who likes to have a parent read to them, or a single person with a dog who sleeps in their bed. But for two adults, that only gives you 27 inches of space each, which is likely not enough for most people to rest comfortably throughout the night. So remember – double’s are actually best for singles! If there are two people in the bed, you are better off bumping up to a Queen or King unless you want to be very cozy! Best For: Young children up to 12 years old, guest bedrooms, college dorm rooms. Room Size: To adequately fit a Twin XL mattress in a bedroom, it is recommended that you leave room to walk around or fit other furniture, a bedroom should be at least 8 feet by 10 feet in size. The minimum size is about 9 feet by 9 feet. However this doesn’t allow for much space between the beds and any desks or wardrobes are going to be on the small side with less than ideal space for getting dressed or moving around. If this reminds you of a cramped college dorm room – you are right! Summary: Coming in at 39 inches, a Twin XL is the same width as a normal Twin. However, it provides an extra 5 inches in the length (hence why it is called a Twin XL) which makes it the length of the standard Queen and King mattresses. A Twin XL is best for those who would go with a Twin due to having a tight space or sleeping quarters, but enjoy the extra length that a Twin XL gives. The Twin XL certainly provides extra leg room for your growing child, and enough that it can be comfortable for college athletes (yes, Twin XL’s are commonly used in dorm rooms). If you want to push two Twins together to use the foam bridge pads, the Twin Xl will allow you to achieve dimensions closer to a King. Room Size: To adequately fit a Twin bed or Single bed as well as have room to walk around or fit other furniture, a bedroom should be at least 7 feet by 10 feet in size at minimum. If you are putting two Twin beds in a room, it should be 9 feet by 9 feet at minimum. Twins are also used commonly for bunk beds, in which case you should factor in extra height but will not need as much square feet. 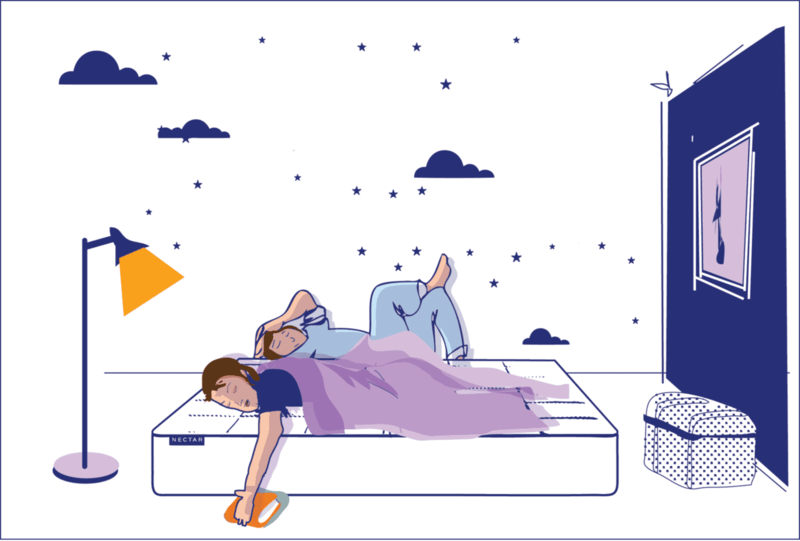 Summary: Most of us have likely slept in a Twin mattress at one point in our lives. They are the smallest mattresses but often found in hotel rooms, guest rooms, or kids rooms. Twin mattresses usually run about 39 inches wide by 75 inches long – making them too small for some adults. So who is best for a Twin mattress? Like we mentioned, these can be good for children, or in guest rooms. After your child graduates from a crib to a Twin bed, you can use safety rails on the side of the Twin bed so they won’t roll off the bed. If you have two children, you might consider two Twin beds in a room, or even bunk beds if they are old enough to be able to climb up and down safely. Depending on the space in the room, or if each child has his/her own room, you can upgrade them to a Full-size, Double, or Queen size bed that they can grow into and have throughout their teenage years. If you have an especially small room and are trying to get more beds to fit, you can even have two sets of bunk beds and sleep up to four! You can also buy bed covers or foam bridge pads for Twins to be pushed together to make a larger bed which is very versatile for both children and most adults. However keep in mind if you do this that while you will get a wide bed, you will not have the length you might need for adults. It’s important to know while there are many different mattress sizes on this list, but there is no “best size.” The most important thing is what is best for you based on how much space you like in bed and how much space you have to work with in each room. And, at the end of the day, the most critical decision to make is what mattress you’ll spend each night sleeping on. 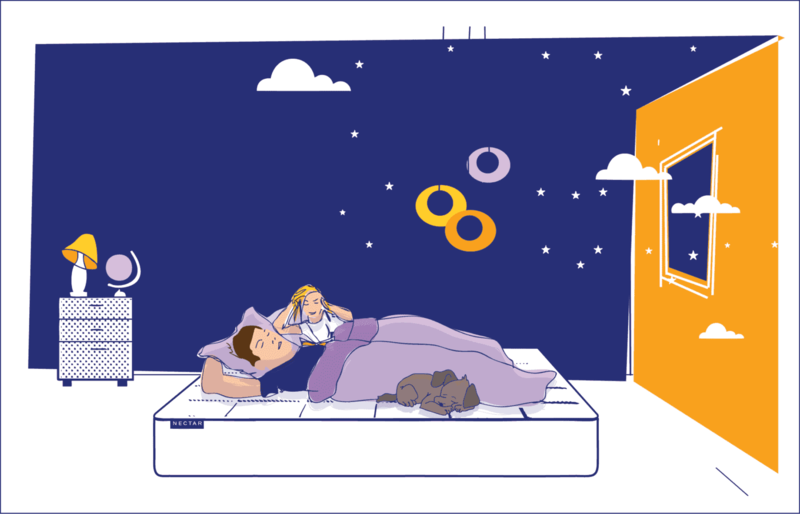 No matter your bedroom size or sleeping position preference, choose a Nectar mattress for comfort, guaranteed. Which mattress size is best? There is no “Best” bed size, only what’s best for you. 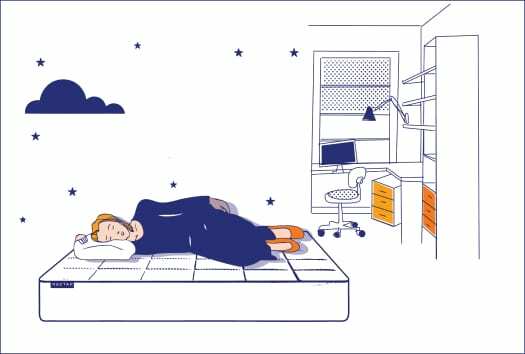 Take into account how big your bedroom is, how much walking distance you need around the bed, furniture in the room, and how much space you need when you sleep (ie, do you sleep curled up like a baby, or like to stretch out!). Also keep in mind if you are single or share a bed with a partner and/or pet. While you need enough space, the most important consideration for your rest is sleeping on a comfortable and supportive mattress. Use our mattress dimensions guide to see which Nectar is right for you. Is a Full size bed big enough for two? A Full size bed is large enough for two if it is a parent reading their child a bedtime story, or a couple sleeping so close together they will be touching. For two adults, a Full only gives you 27 inches of space each, which is likely not enough for most people to rest comfortably throughout the night. So remember – double’s are actually best for singles! What size bed do most couples have? Most couples choose to have a King or California King sized bed based on preference for more space for each person. However since space can be limited, the next most favorable bed size for couples is a Queen. Unfortunately anything smaller than a Queen is going to be a tight squeeze and you will feel your partner rolling around at night. A King size Nectar memory foam bed reduces motion transfer significantly so you will get a great night’s sleep with partners and/or pets in the bed. What size bed should I get for my room? You should get the sized bed that fits your room best. Use our mattress guide to help you determine the best size mattress for your room. Does bed size affect marriage? Some couples like to sleep in a smaller bed to feel close and cuddly, while others prefer a little space. Sleeping well with your partner is helpful for marriage. Being in a bed that is too small and feeling your partner toss and turn, or feeling crammed into bed won’t be fun for anyone. When you wake up rested, you will be more prone to have a healthy, happy marriage. However, when you have a bed like Nectar that reduces motion transfer, and has a cooling Tencel cover so you’ll never sleep hot, some of the size-related issues diminish. Is a Double bed too small for a couple? Most people will say that a Double bed is too small for a couple unless you like to sleep very close together. Being in a bed that is too small and feeling your partner toss and turn, or feeling crammed into bed won’t be fun for anyone. However, when you have a mattress like Nectar that reduces motion transfer, and has a cooling Tencel cover so you’ll never sleep hot, some of the size-related issues diminish. Is a Full sized bed big enough for two people? A Full sized bed is big enough for two people, but it is not recommended for couples. A Full sized bed is ideal for a child, and a parent reading a bedtime story, or a person and their pet – but not two adults who need room to move around at night or have different sleeping positions. What is the biggest size of a bed? The largest bed manufactured is a California King. At 72 inches wide by 84 inches long, the California king mattress is 4 inches narrower than a king size mattress, but it is 4 inches longer. Can you make two Twin beds into a King? Contrary to popular belief, two regular Twins do NOT equal a King. In fact two Twin XL equal a King and can be a good option for someone using two Twin XL in a guest room that they can also push together. Two regular Twin mattress are the same width but shorter in length than a King by 5 inches. Can you put a Queen mattress on a Full frame? No, you can not use a Queen bed on a Full frame as it will not fit. A Queen is larger than a Full, so you need a Queen frame for a Queen mattress. It’s best to always match up your mattress, frame, and sheet sizes for your best night’s rest. What size sheets for two Twin beds pushed together? For two Twin beds pushed together, you are going to be hard pressed to find sheets that fit. A standard Twin bed is 39 inches wide and 75 inches long; a standard King bed is 76 inches wide and 80 inches long. However, if you use Twin XL beds, you can push them together and use King sized sheets. What is two Twin beds equal to? A standard Twin bed is 39 inches wide and 75 inches long; a standard King bed is 76 inches wide and 80 inches long. Therefore two Twin beds are not quite equal to a standard king bed. However, two Twin XL are equal to a King. A good mattress should be 11 to 15 inches thick. Depending on the combination of foams, coils, latex, and covers, mattresses will vary in size. The thickness can affect how comfortable a mattress is, and Nectar mattress has found that the ideal thickness is 11 inches in order to be comfortable, soft, and supportive. We use multiple layers of premium contouring foams to build the most comfortable mattress. We found that a great mattress should be at least 11 inches thick, with luxury mattresses usually being 15 inches. How high should a mattress be? The best mattresses are normally 11 to 15 inches thick. Depending on the combination of foams, coils, latex, and covers, mattresses will vary in height, but you want to look for something in the range of 11-15 inches for optimal comfort. 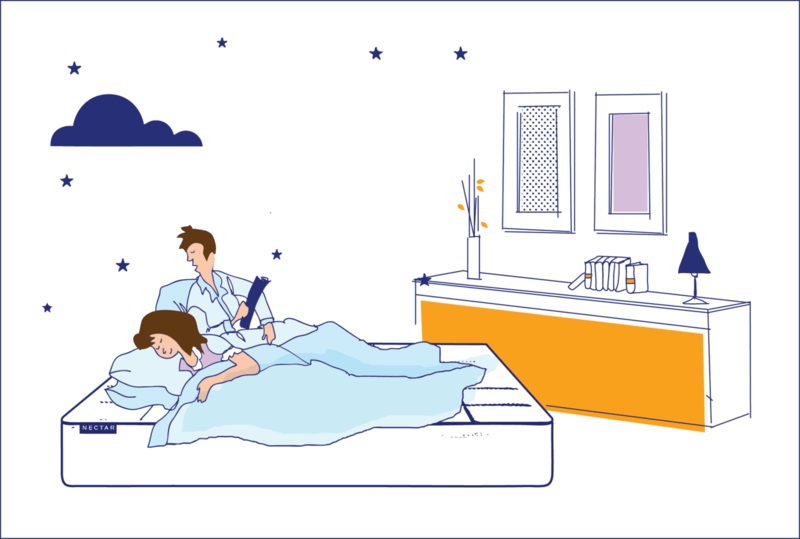 The thickness can affect how comfortable your bed is, and Nectar mattress has found that the ideal thickness is 11 inches in order to be comfortable, soft, and supportive. We use multiple layers of premium contouring foams to build the most comfortable mattress. We found that a great mattress should be at least 11 inches thick, with luxury mattresses usually being 15 inches. How high should a bed be? The average bed height is normally found to be about 25 inches. This is so your feet can reach the floor when you’re seated on the edge of the mattress. You can find a higher antique bed, about 36 inches off the floor, or a more contemporary, modern platform bed which is lower, around 18 inches. While it is personal preference, you want to be able to get in and out of bed with ease.